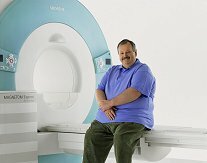 Does my size matter if I need an MRI? Generally speaking you can get a high-quality MRI scan in a comfortable setting regardless of your body size. Access to care is not driven by body size though your personal comfort may come into play. In fact, professional athletes of all shapes and sizes have completed an MRI scan or two! The opening of the MR unit, called the bore, varies in width and this may directly impact your comfort level. If you have serious concerns about space you should ask the facility if they have an "open" MRI. The scan time on an "open" MR unit may be longer because it can take longer to acquire the images of the particular body part. The more confined the space or the pain associated with your injury may also impact your ability to remain still during image acquisition and therefore, the scan will take longer. But be assured plenty of patients fall asleep and enjoy a power nap during the scan. Recent technological advances have led to the high-field open bore MRI that can accommodate a patient up to 550 lbs and deliver high quality diagnostic images. As a patient, ask about ways to increase your comfort level. The little things, like music, may make you more comfortable and less focused on space. I have accompanied my daughter and my mother into the scan room to help reassure them. So ask if a guest can come into the scan room (provided they have been properly screened). Some patients like to cover their eyes to relax. Medical care is a personal experience so try what works for you.